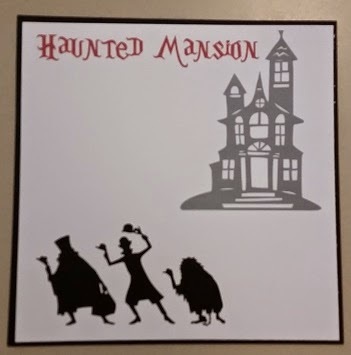 Today at Frosted Designs we are showcasing Halloween projects! I am LOVING gleatos!!! They are fun to color and blend on canvases. 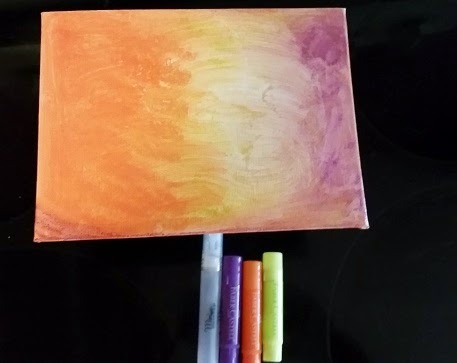 I took purple, orange and lime green and colored on a blank canvas board. Then I misted the board with water and used a brush and paper towel to blend the colors. You can add more if you want until you get the results you like! 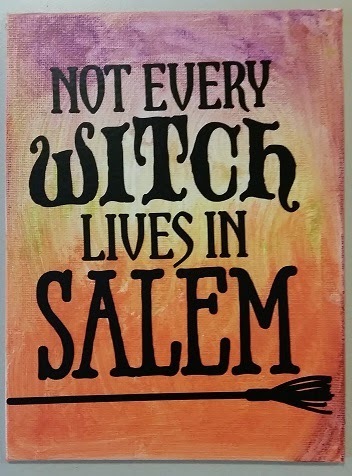 I purchased this saying from the Silhouette Store and cut it out in black vinyl. Some days I think it is talking about me!!! Friday night was Trunk or Treat Night at my son's school. 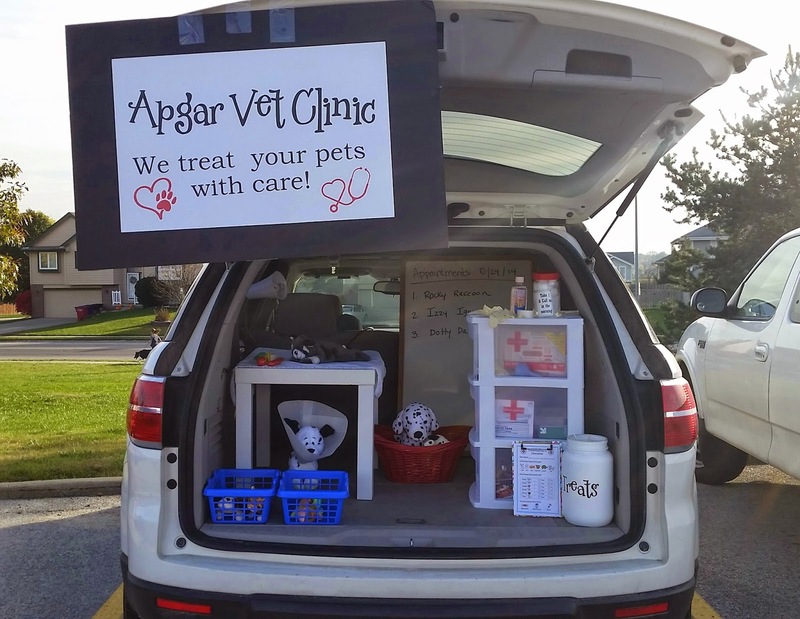 I decorated my car as a Vet Clinic. 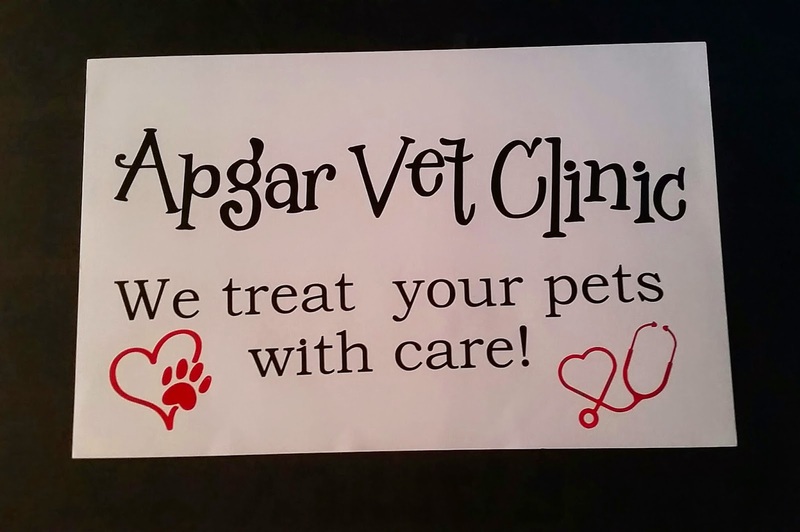 I tried as hard as I could to treat all of the animals (and butterflies and even a bee) that came to my clinic, but no one would get on my table!! Elsa forgot to bring Sven to his appointment too!! 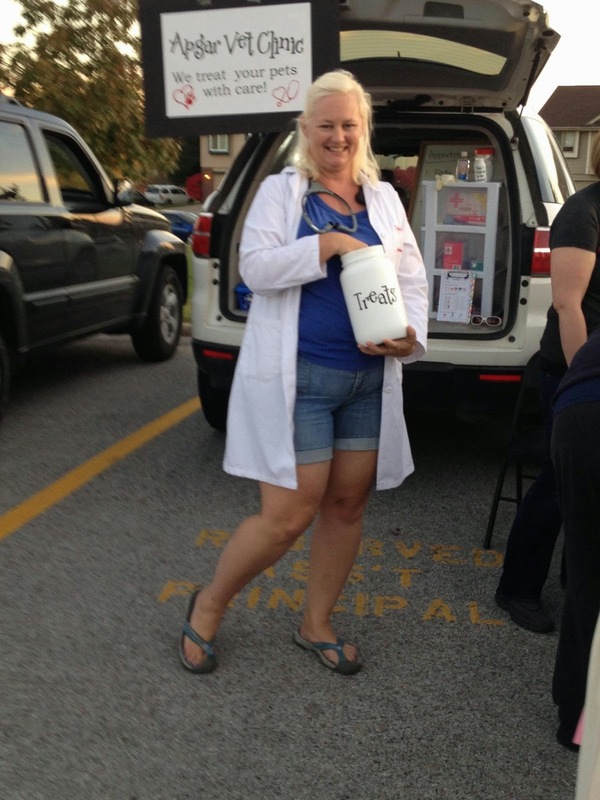 I still had fun passing out "treats" to everyone! I used my Cameo to design and cut out my sign. I used vinyl on poster board. I adhered the poster board to a piece of black foam core board and taped it to the top of my hatch. 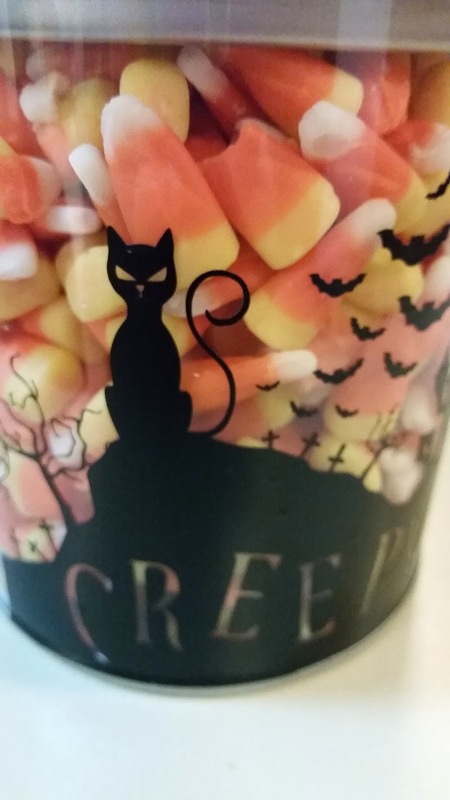 I filled my "treats" container with candy. I printed off some checklists for treating animals. 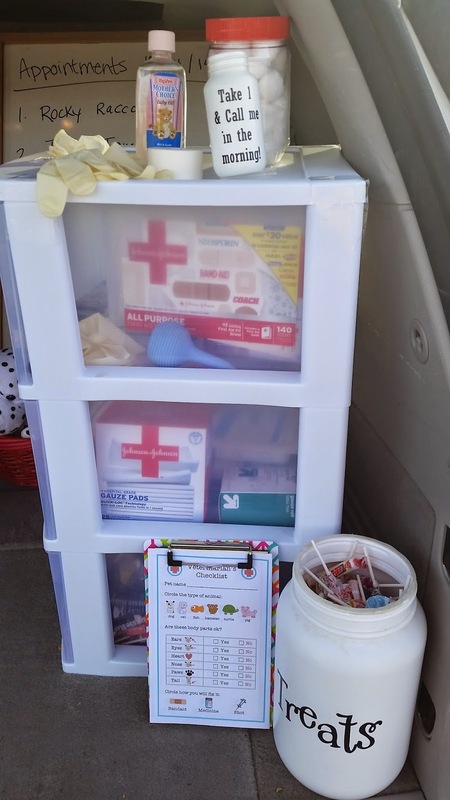 I included some first aid supplies and toys from my daycare. Here are some of my patients. 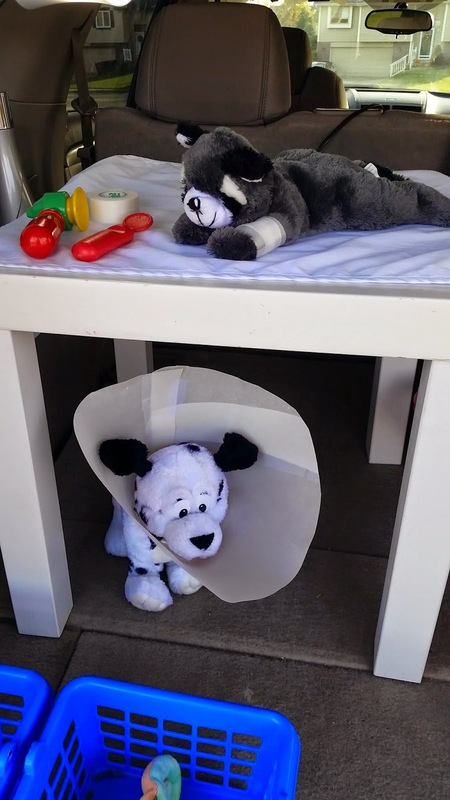 Rocky Racoon has a broken arm, Dotty Dalmation has stitches and Izzy Iguana has a sore throat. I had a lot of fun with the animals (and children) who came by!! Hello - I am featured today at The Buckle Boutique! Many of you know that I am a baseball mom. 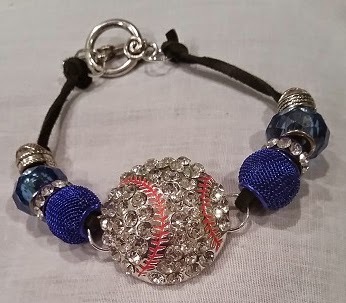 I am not normally a super blingy gal, but I am for baseball!! I have blingy sunglasses, flip flops, hat and shirt - now I have a baseball too. I got this baseball slide HERE. It is a ribbon slide, so I took 2 jump rings and put them on the slide bar. I tied the leather cord to the jump ring on the slide as well as the jump ring on the clasp. I added some beads in blue to match my son's baseball uniform. 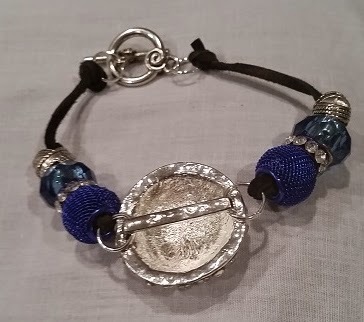 Even though it is not baseball season right now, I can wear this bracelet as I cheer for the KC Royals!! My son plays for the Storm Chasers - a select youth baseball team that is associated with the Royals minor league team. 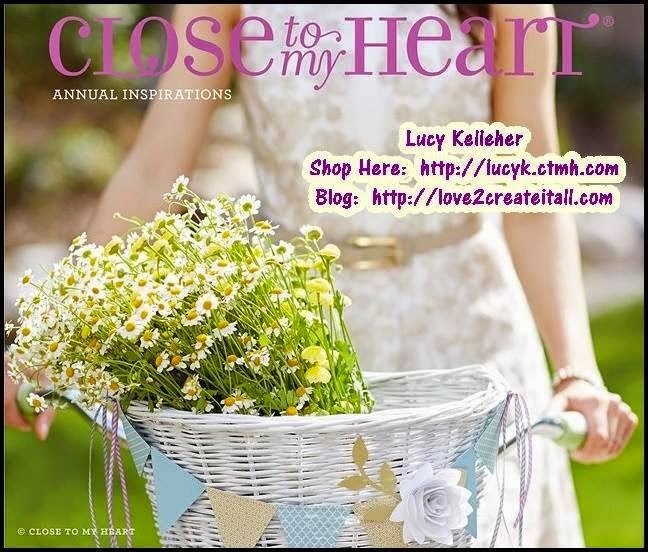 Today I am featured at Frosted Designs. I just love fall - it is my favorite time of the year! We went to the Pumpkin Patch last week and my friend captured this picture of Tanner picking his pumpkin. I wanted to showcase this photo all by itself so I grabbed papers from the Garden of Abundance kit. I realy like the colors in the flowered paper - they look similar to the brown and green in the pumpkin patch. I needed a pinch of orange so I grabbed an orange gelato and colored around my photo mat and title mat. 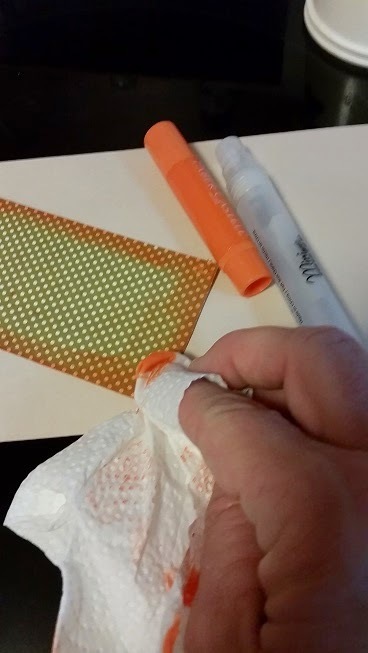 I spritzed my paper towel with water and blended the orange around the edge of the paper. 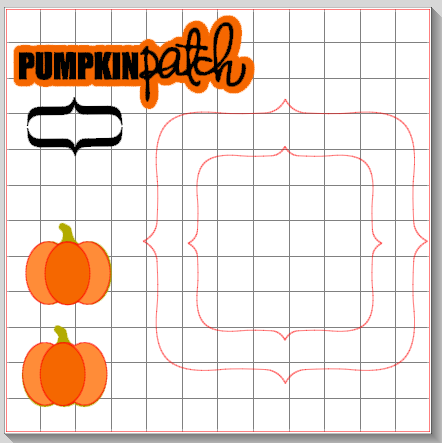 I used my Silhouette Cameo to design and cut the tree, pumpkin border and title. I just love that tree! I inked the pumpkins a bit with some moss green ink and then spritzed them with Heidi Swapp gold color shine. Look at that gold on these pumpkins - just gorgeous!! 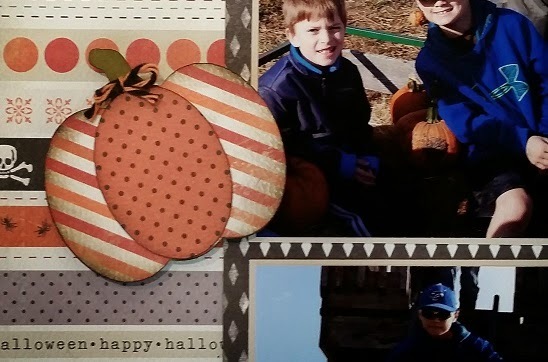 I cut some of the pumpkins off the border and pop-dotted them on the page. I added the wood heart to the tree trunk and a bird in the branches. 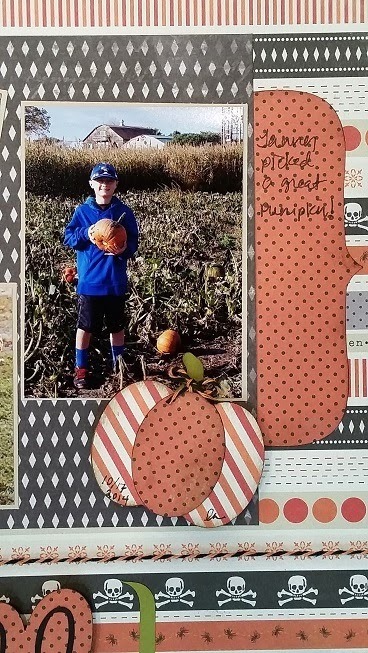 Enjoy your fall and don't forget to create and share your stories!! We would not want you to miss any of these wonderful projects. So, grab yourself a Latte', sit back and hop along with us as we share our projects with you. 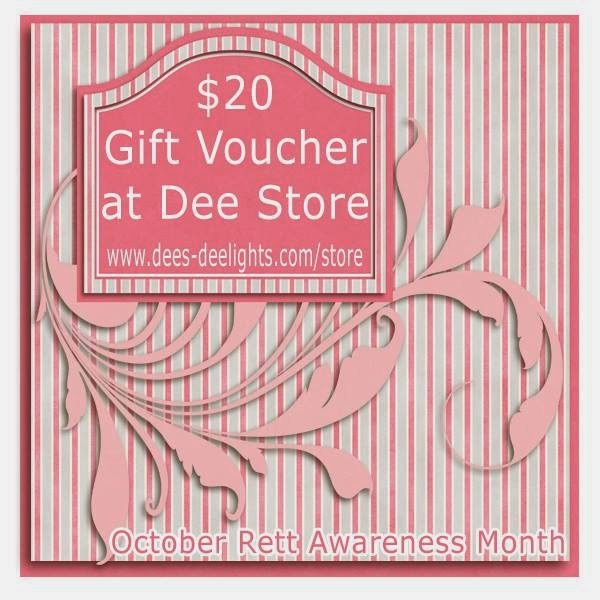 October is Rett Syndrome Awareness Month, so I wanted to help get the word out and what better way to do that than with a blog hop. Rett Syndrome strikes without warning. A girl with Rett Syndrome usually starts out as a happy and healthy baby. Then something goes terribly wrong. She loses the ability to speak, she can't use her hands to play with toys, or to even feed herself, and she may lose the ability to walk. Rett Syndrome is caused by a mutation of the MECP2 gene on the X chromosome. 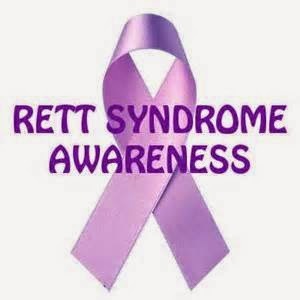 Rett Syndrome is found in all racial and ethnic groups throughout the world, and in every socioeconomic class. 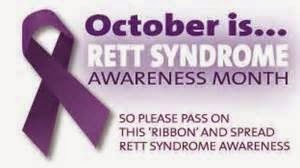 Rett Syndrome affects 1 in 15,000 female births. *If able to walk, then with a shaky, unsteady gait, or toe-walking. But most do end up using a wheelchair for the most part. Many individuals with Rett Syndrome live well into adulthood, although there are some that do not get that chance and end up losing their battle to Rett Syndrome at a very early age. Most people including Doctors are not aware of Rett Syndrome, so, please help me get the word out about Rett Syndrome and hopefully the more that know the faster we can help in finding a cure. A Collection of Snap Products by Simple Stories. 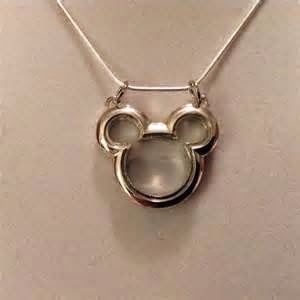 Everything you need to put together your Disney memories. The kit comes with an Album, a pack of Insta Pocket Pages, "Say Cheese" Journal Kit, and the "Say Cheese" Snap Pack. 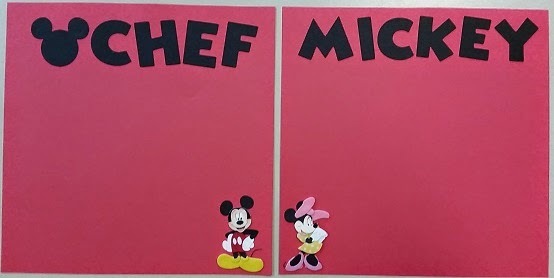 Without further ado...Our Disney Projects. 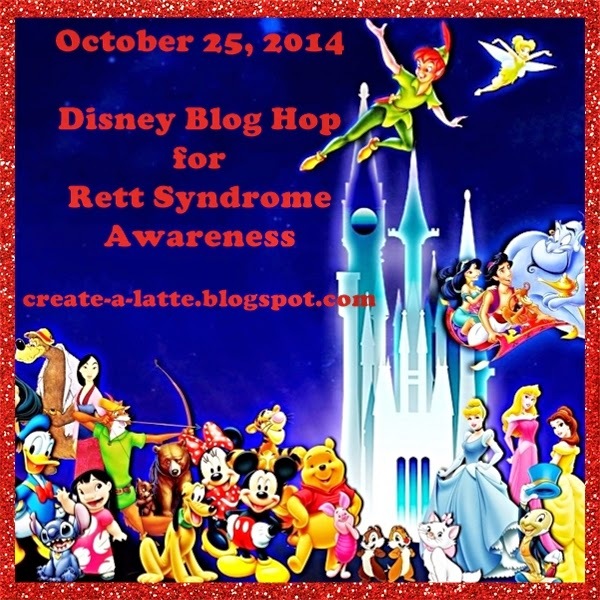 I felt honored to be asked to join this hop and spread awareness about Rett Syndrome! 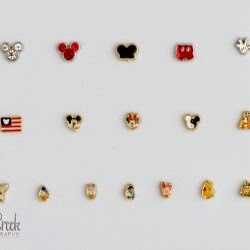 We are headed to Walt Disney World in a couple of weeks. 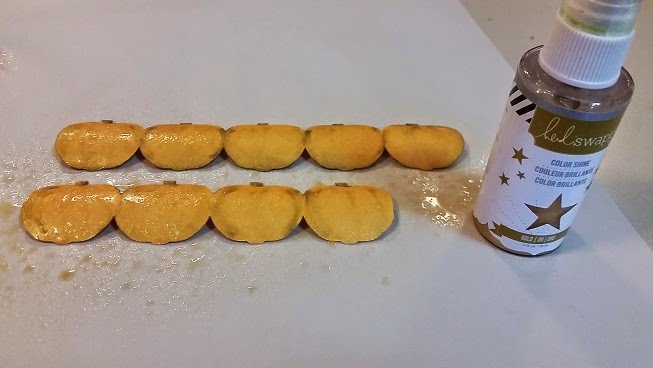 This is not our first trip, but it is the first time we will go close to Christmas time! Every time we go, I pre-make an 8 x 8 scrapbook album for autographs and pictures for my youngest son. His older brothers are 19 and 24 and no longer want an album!! Because Tanner is 9, he wants less autographs and more photos in his album. We are eating some character dining breakfasts and dinners, so I made sure to include those pages. I also leave some generic pages just in case he wants an autograph or two. I started with the above images that I found on Pinterest. With the help of some friends, I traced and cut the images on my Cameo. 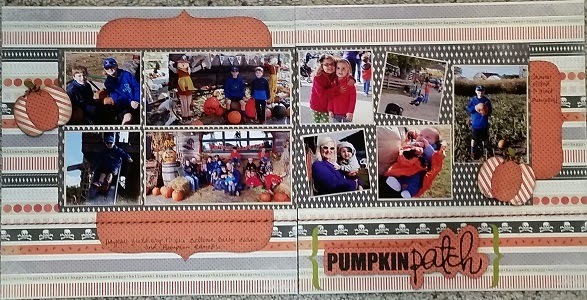 I made two 2-page spreads that will hold a 2x3 picture that I can print off with my Zink hAppy printer using photos from my cell phone. 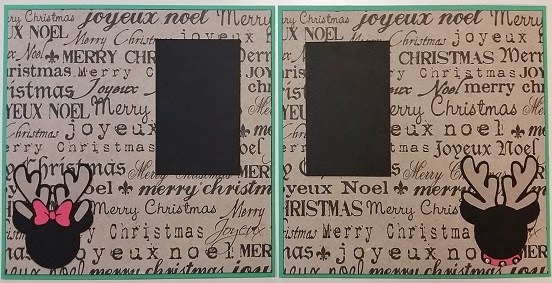 I matted the photo areas with black cardstock. 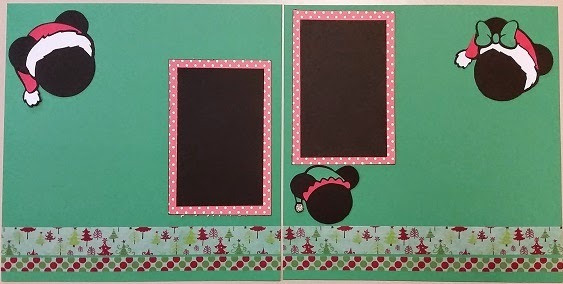 I added washi tape on the green pages. 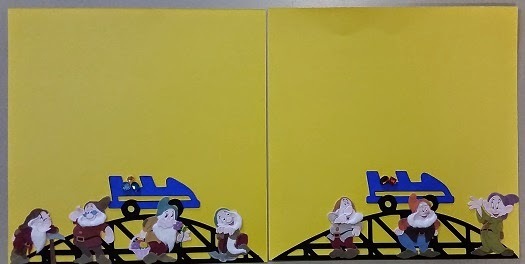 I know he will LOVE the 7 Dwarf Mines ride, so I cut this roller coaster set from the Silhouette Store using my Cameo and added these stickers. We are spending part of a day in Downtown Disney and will go bowling at Splitsville. 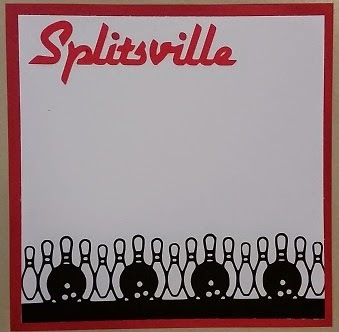 I used this bowling border from the Silhouette store. We are also planning a hot air balloon ride. 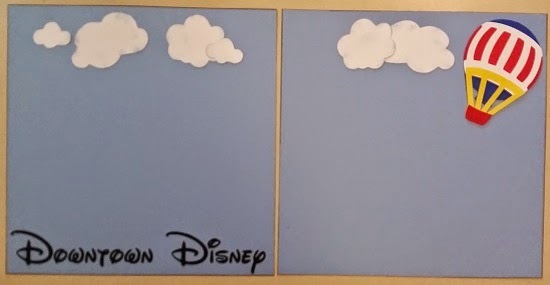 I cut the clouds and hot air balloon from cuts found in the Silhouette Store. I used a font from my computer called Walt Disney Script (found on dafont.com) for my words. 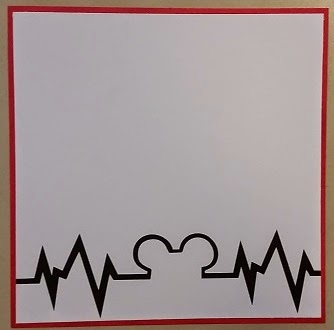 This simple page was cut with my cricut. I used Mickey Font for the words and added stickers. 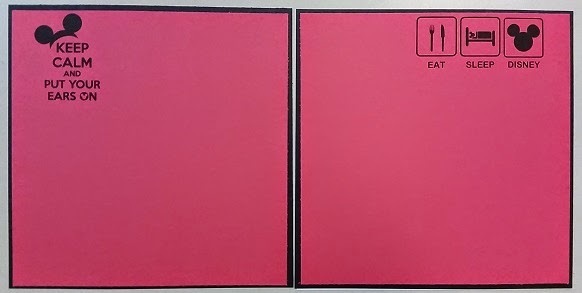 I made three sets of pages like this for all the characters we will see at breakfast. These next pages were designed in Silhouette Studio and printed out. My mother-in-law just loves the Haunted Mansion!! I could not resist!! I found the three ghosts on Pinterest. 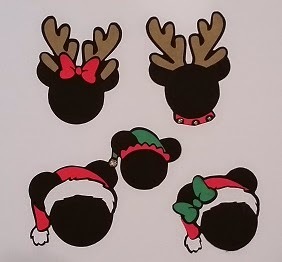 These images were also found on Pinterest and printed out on red cardstock. Another favorite image from Pinterest printed out. I made a second page just like this one! 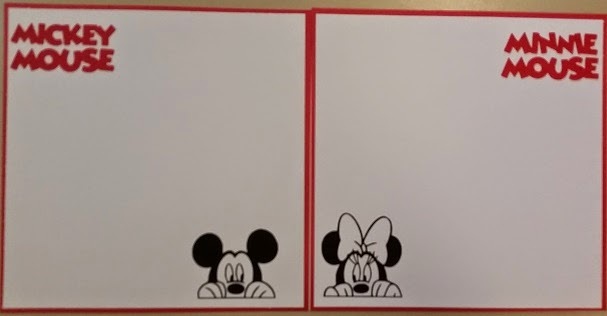 I printed Mickey and Minnie on these pages and cut out the words on my Cricut. These images were also on Pinterest. I printed Donald and the words. 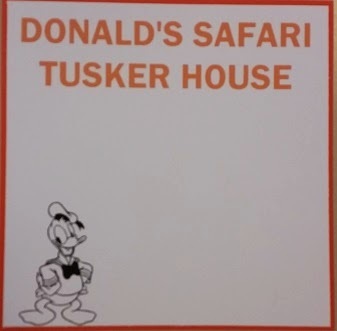 Donald was found on Pinterest and the font was from my computer. 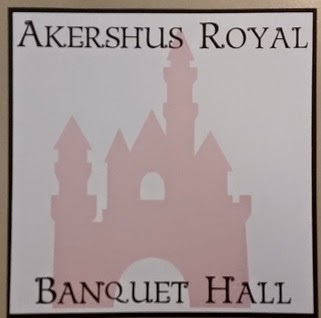 I printed the pink castle (from the Silhouette Store) and layered the words on top. I printed out 6 of these. They won't reveal which princesses will be at the restaurant yet, so I have stickers to add later. The Sci-Fi Dine-In Theater is a fun one. You sit in a car at the drive in and eat! 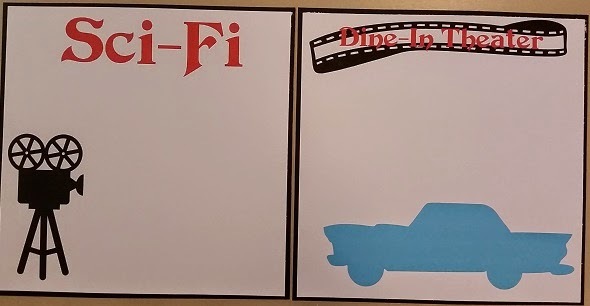 I used images from the Silhouette Store and a font on my computer to create and print these pages. My favorite part of Disney is feeling like I am 4 years old EVERY time I go there!!! I hope your Disney Dreams come true!! for your next stop and see her wonderful project that she has made to share with you today. 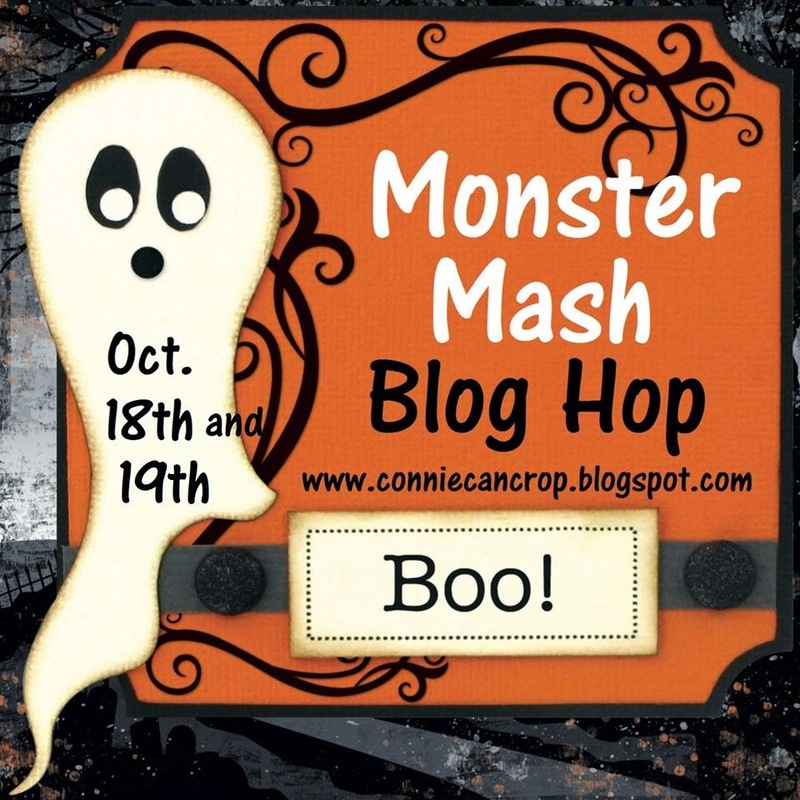 If you get lost along the way here is the entire line up for today's Blog Hop. Thank you for hopping along with us today, I hope that you have learned something about Rett Syndrome and that you will help spread the word so that we can make as many people aware of this as possible. 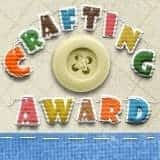 I also hope that we have inspired you to get your craft on. Hello and Happy Wednesday!! 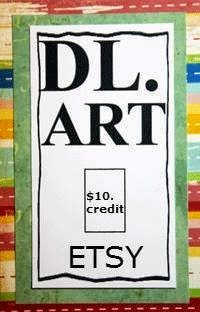 Today begins another sketch challenge at Let's Scrap!! Last Friday we took our annual field trip with the daycare to the Pumpkin Patch. The photos were perfect with these Carta Bella papers. 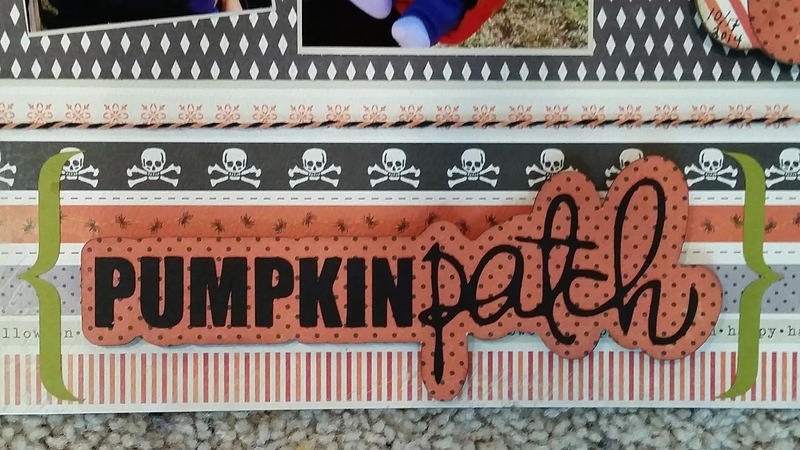 I created the background shapes, pumpkins and my title on my Silhouette and cut them out with my Cameo. I cut out the layers with cardstock and Carta Bella papers. 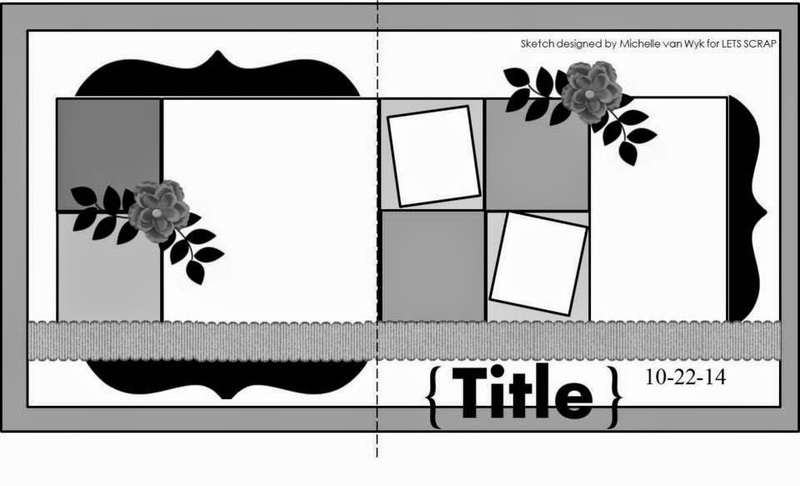 For the title, I created an offset layer so the letters would stand out on the busy paper. I pop-dotted the title to my layout. 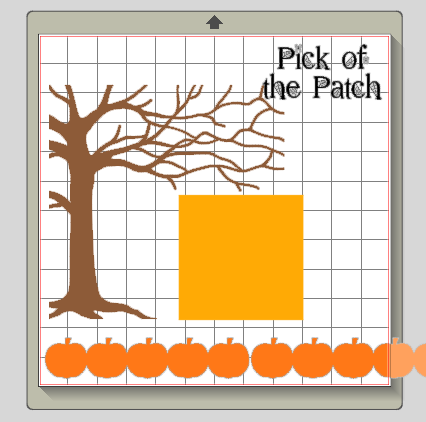 I pop-dotted the pumpkin on my page. I wrote some journaling on the background piece. I inked the edges of all of my papers with Vintage Brown ink. I used orange and black twine across the bottom of the layouts. I added a bit more journaling here. Here is another pop-dotted pumpkin. 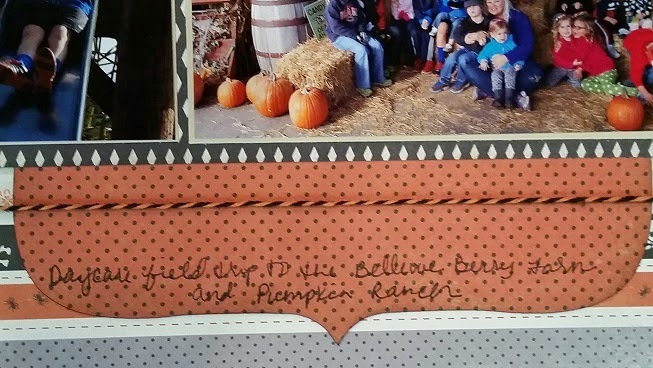 You can see my son Tanner and his best friend (Tanner's head is a little cut off) in the hayrack ride. We have such a great time at the pumpkin patch every year. 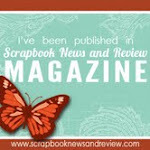 I hope you join us at Let's Scrap!! Connie">http://conniecancrop.blogspot.com/">Connie Can Crop and her ghoulishly wonderful friends are so glad you could join us for this Monster Mash! We have so many frightful projects you'll be screaming for more! 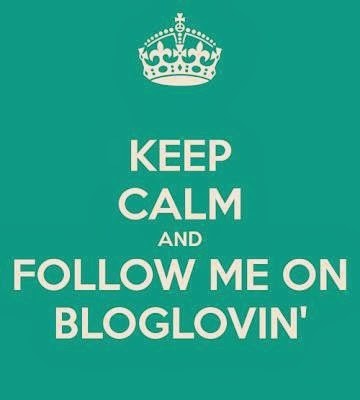 This is day #2 of the blog hop and we appreciate your leaving a comment for all of these talented creatures who are here sharing their ideas and creations. We are thrilled to death that you came back! The guests included Wolf Man, Dracula and his son! We have three terrifying yet amazing sponsors and giveaways for this hop! Creative Kuts is giving one lucky winner a $10 gift certificate for their online store. Be sure to check out their spooky SVG files! 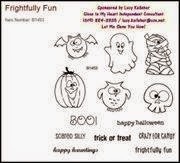 Perfect for your Halloween creations! You will have until 12:00 am Monday to finish the hop and leave your comments. Be sure to follow everyone and leave your spirited comments along the way! Let's get this Monster Party started! I found this design online. It was used on a mason jar, but I wanted a bigger container. I purchased this clear pail at a local craft store. I sized the image to fit the front half of the bucket and cut it out in black vinyl on my Cameo. 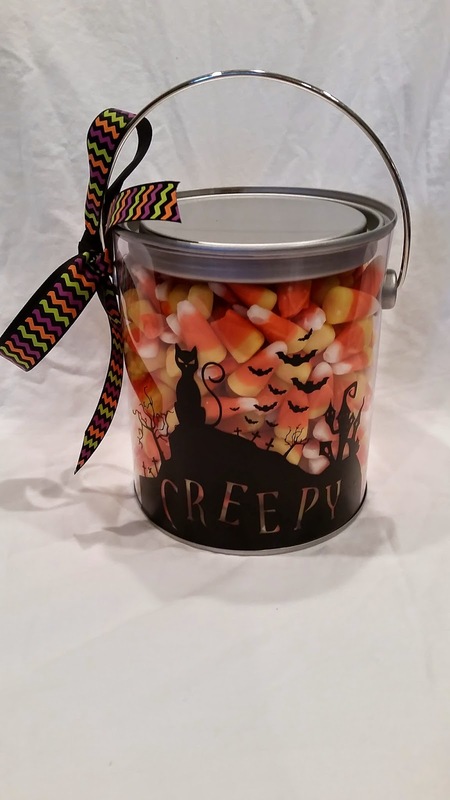 I filled it up with candy corn and tied a bow on top. I love the creepy cat and the bats!! This will make a nice Halloween gift! Up next is the lovely and talented ASHLEY! Thanks so much for joining us for such a fun day! Happy Haunting!